In 2010 we wanted to make an artwork to comment and reflect on Australia Day and some of our feelings about the origins of the date – the implications of that event and the repercussions that we live with and navigate today. 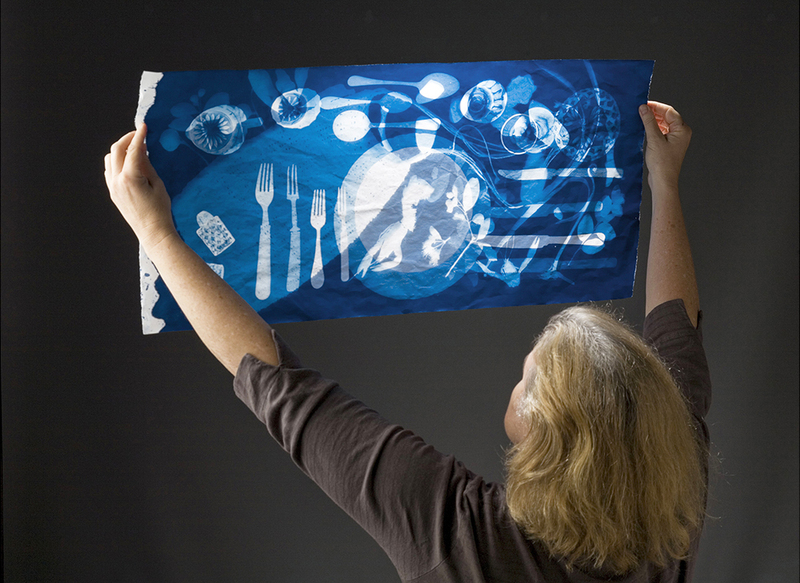 Through a scorchingly hot day in Toowoomba we worked with cyanotype solutions and selected objects – some from our home and others sourced from the food scraps from a local seafood smorgasbord restaurant on the day. The work that we did that day emerged as the collaborative artists’ book, a broadsheet we titled, Australian Banquet, January 25/ 26, 1788. Across Australia over the January 26th long weekend, people prepare, cook and consume food to mark this day in history. For us, this work is our response to, and in recognition of, the ‘turning of the page’ in Australian history that this date represents. One day, January 25th 1788, Aboriginal people feasted on a diverse banquet of bush tucker as they had for thousands of years. The next day, the country was transformed by a new paradigm represented in this work by the table setting of the First Fleet. Australia Day, for us, is an important time to acknowledge the First Peoples’ perspective and their knowing of land, culture and history and how it should be recognised as underpinning the diversity and identity of contemporary Australia. We, as descendants of European people, are seeking to understand and know more about our place within the longer history of this land. The work is to be viewed/read in a display context with a spotlight directed onto the work. The 25th of January side of the broadsheet is viewed and contemplated. The broadsheet is then turned over to view the 26th of January side. Finally the broadsheet is held up to the light – the complex interrelationship between the two visual references to be seen and considered.